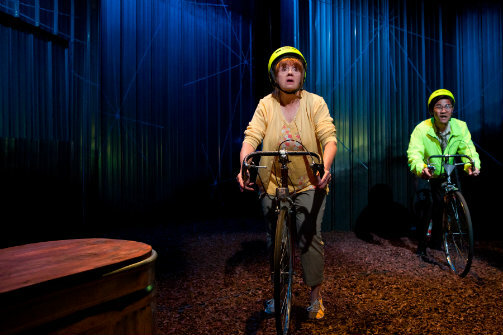 Features Annie Golden from "Orange is the New Black"
Annie Golden and Daniel K. Isaac in Underland at 59E59 Theaters. Photo by Hunter Canning. BOTTOM LINE: A well-acted and atmospheric play that suffers from a lack of focus. The word “Australia” conjures up images of a vast, colorful outback filled with exotic creatures, groovy surfin’, and charming locales ready to say “G’day, mate.” However, in Underland, playwright Alexandra Collier (who hails from the land down under) creates a scorching hot and unforgivingly starving world that threatens to consume its own people at will. The inhabitants of this world include fifteen year-olds Violet (Angeliea Stark) and Ruth (Kiley Lotz), both of whom have grown up in this town and have vowed to get out somehow. It also features their teachers: the strict and authoritative Mr. B (Jens Rasmussen), the worldly and compassionate Ms. Harmony (Georgia Cohen) and Mrs. Butterfat (the delightful Annie Golden, from TV’s Orange is the New Black), a widow who bemoans how no one cares about her. We also meet a Japanese businessman named Mr. Taka (Daniel K. Isaac). Bored out of his mind at his Tokyo office job, he amuses himself with a Tamagotchi until he discovers a mysterious tunnel that spits him out into the dangerous outback of Australia. The eerie atmosphere of this town is well depicted in Collier’s script with help from director Mia Rovengo. The hungry rumbling of the quarry, where the dead have been piling up, is heard throughout the play. Reports of nearby crocodile sightings are increasing. “A place like this’ll look for a way to eat you up,” is a mantra that is repeated throughout. Collier and Rovengo have succeeded in creating a nightmarish and unsettling world in which the character’s need to escape is understandable. This is well supported by Gabriel Hainer Evansorn’s stark and spare set, Burke Brown’s atmospheric lighting, and Elisheba Ittoop’s ominous sound design. What’s less successful, unfortunately, is the confused narrative that takes place in this world. The characters' stories never gel, and as a result, the play feels unfocused. It doesn’t seem to know which story it wants to tell. Does it want to explore Ruth and Violet’s need to escape their hometown? Ms. Harmony’s immersion into a strange new territory? Her affair with Mr. B? Mr. Taka’s quest to return home? Late in the play, major events happen to the characters with little to no explanation, and by then, we don’t know enough about most of the characters to really care about them. The only ones for whom we’re given somewhat of a backstory are Mrs. Butterfat and the discombobulated Mr. Taka. Despite Daniel K. Isaac’s touching performance, Mr. Taka’s brief presence feels almost superfluous in the play, suggesting what we can already infer: that the urban world beyond the bleak Australian suburbs is just as soul-crushing and uncaring. Even if the characters aren’t the strongest, the performances certainly make up for it. Stark and Lotz are very convincing at portraying the awkwardness of the mid-teenage years. Rasmussen is strong as the authoritative Mr. B, and is nicely foiled by Cohen’s lovely Ms. Harmony. Golden gives the strongest performance as Mrs. Butterfat. She provides excellent comic relief, but also brings out multiple layers in her character. She casts icy, critical glares one moment, then emanates gentle warmth the next. It is also clear from her performance that Mrs. Butterfat has lived a life with the knowledge of the quarry’s hunger, and how it will eat up those who stay in town too long.